It looks like a growing number of professional investors are preparing for a stock market crash, as hedge fund filings for the second quarter show a spike in defensive positions. In particular, legendary billionaire George Soros made a huge bet against the market. He increased his short position on the Standard & Poor's 500 by a startling 605%. The 9.69 million new shares of SPDR S&P 500 ETF Trust (NYSE Arca: SPY) put options gave Soros a total of 11.29 million shares and made it the biggest holding in his portfolio. Soros also added significantly to several gold positions, a "safe haven" move that's typically made when investors suspect a stock market crash is on the horizon. And Soros wasn't the only hedge fund manager making defensive moves. Several, such as Carl Icahn, increased their holdings in energy stocks, and in particular energy stocks that pay a healthy dividend. That's also a type of hedge against a stock market crash. Others have been snapping up 10-year Treasurys and buying more put options than usual. "You definitely are seeing managers reduce risk levels," Robert Duggan, a managing director at Skybridge Capital, told The Wall Street Journal. "'Cautious' or 'more defensive' are clearly things you hear when you speak with managers." 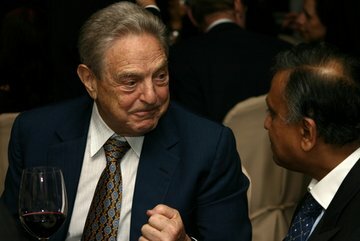 Soros, for instance – despite buying all those SPY put options – made big additions to several of his long tech positions, including approximately 1.2 million shares of Apple Inc. (Nasdaq: AAPL), 1.79 million shares of Facebook Inc. (Nasdaq: FB), 2.4 million shares of Intel Corp. (Nasdaq: INTC), and 1.8 million shares of Microsoft Corp. (Nasdaq: MSFT). That certainly doesn't look like a hedge fund manager planning for a stock market crash – but if you dig a little deeper it becomes clear exactly what Soros and his fellow hedge fund managers are up to – and it makes perfect sense. Nowadays there are several broad-market indexes and hundreds focused on various segments (small caps, growth stocks, technology, etc.). They all have their idiosyncratic rules and perspectives, which means one alone could distort the market picture. But used together they are more likely to provide a more comprehensive view.